rats cohabitating with them. When weather gets bad, rats will make their way into whatever warm and dry shelter they can squeeze into, so if your home has holes or cracks in the soffits of exterior structure, you’re prone to dangerous and expensive infestations. By sealing any holes or cracks in your home, you will lessen the chances of rats infiltrating. 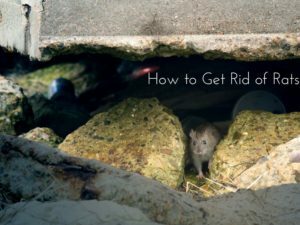 If rats have already made their way in your home, we at Critter Control® West Palm have put together a list of how you can get rid of them. Locate Their Hideout. If you can find where the infestation spends most of its time, you can figure out a way to cut them off from food, water, and other resources. Isolate the population by sealing up any entrances or exits. Live traps are used for smaller infestations, and with the intent to trap and relocate rats. Snap Traps can kill rats instantly, but will often be messy. A professional will need to remove the rat carcasses. Glue traps are the least humane of the three. Since the rats will die slowly, they may crawl around after caught in the trap and spread the glue everywhere. Poison should never be used. It is dangerous to humans and pets and can be fatal if used incorrectly. If poison is ever used to get rid of rats, it will only be utilized by a trained professional with the proper tools. Enlist the Professionals. To make it easier on yourself, and keep you and your family safe from infectious diseases, call a professional with the proper tools and knowledge to remove the rats from your home. Even if you capture some in traps, you will still need to hire a professional to dispose of their bodies properly. Touching a rat, no matter dead or alive will put you at risk for diseases like leptospirosis and rat-bite fever. When you call on the help of Critter Control® West Palm, you’re getting over three decades of experience, personable and transparent technicians, and the highest quality of service in the field. Don’t put you, your family, or your home in danger any longer. Call us today at 561-274-0224 for your free consultation.